I saw the flag burning story in HD on FNC. Was wondering how you got it there in HD..
We also FTP or dropbox from any of the +12 NLE's here and 8 @ WOLO (in Columbia) to FOX and CNN fairly quickly since we have a big fat pipe. All of WCCB's & WOLO's HD pkgs are drag & dropped directly into the 5 play to air servers from the NLE's at slightly faster than real time. I had my DVR set to record Highway Patrol at 5:00 AM this morning on 3.2 and got something from Bounce, so I reprogrammed it to 3.3 for the rest of the week after unlocking 3.3 and then locking 3.2. Wonder why the switch? Interestingly, this afternoon during a movie on ThisTV 3.3, the video and audio dropped out for several seconds, followed by a weather channel screen being displayed for maybe 10 seconds, then back to the movie. I hope that wasn't a test and that WBTV isn't planning to drop ThisTV in favor of a weather channel like they used to have. Meanwhile, TVGOS is displaying the wrong program schedules for both 3.2 and 3.3. We have a similar system that is tied to all the LTV and Trib stations. They have corrected the channel listings somewhat, but the program info is still backwards. And I believe WXII-12 also carries This TV. Not sure why they changed but they probably thought 3.2 would give Bounce more visibility. 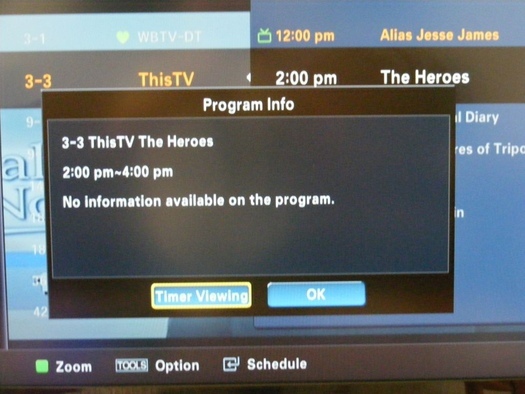 As of January 1, 2012, Bounce TV and ThisTV changed channel positions on WBTV's digital tier. Bounce TV now airs on WBTV's digital channel 3.2, Time Warner channel 106. We are working on getting all of the digital program listing guides to reflect this change, thanks for your email! It would seem to me that "primary digital channel" would mean 3.1. HEY! HEY! HEY! Say Fat Albert! I wish one of the local channels would pick up this cooking show. I saw this show and it only took a few minutes for me to figure out that Marvin must be from the Carolinas. I looked into it and found that it's produced in Conway/Myrtle Beach by WPDE. Sounds like that show would be a good candidate for the Live Well Network on 36.2 for viewers who are interested in cooking shows. I noticed this has been straightened out on my receiver now. Bounce is on 2 and This is on 3. Now if WHKY would do the same I'd be set. Anyone know the timing on WZJY adding TCN to 46.3? The TCN website now lists them as an affiliate. 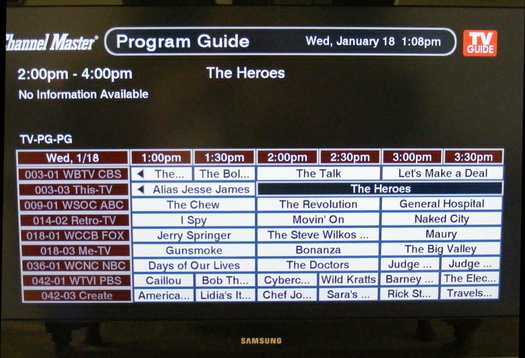 The channel titles are now correct, with Bounce on 2 and This on 3, but the program information is still backwards. WHKY program guide is correct. On Dish Network receivers it's not. They say it's the station's fault and responsibility to fix. I don't know who is at fault since I brought this up in here in October and it's not changed. In the mean time, WBTV and WJZY have both made guide changes, it seems, without any issues. If there is a better avenue to raise the issue with WHKY, I will be glad to do so if it helps. I noticed this morning that TitanTV now has correct schedule listings for Bounce 3.2 and ThisTV 3.3. I hope that TVGOS gets updated soon. I record Highway Patrol at 5:00am and right now I have to manually create time recordings on my DVR (like we used to on a VCR) since I can't just click on the TVGOS listing. This also titles the recordings incorrectly, i.e. "Soul Train" instead of "Highway Patrol". But, Dan Mathews (Broderick Crawford) still ends up nailing the bad guys! The program info is now correct on 3.2 and 3.3. No longer backwards. But they should also provide the program description for This TV in addition to the title of the movie. This info is provided for This TV on 4.2, so I know they could do it. And for Bounce as well. I just checked 3.2 and 3.3 on my TiVo. It looks like all program information, to include program titles and descriptions, are displaying correctly. Hopefully, no one is continuing to experience issues with these subchannels at this time. The program titles for ThisTV on my TV (PSIP) and on my CM-7000PAL DVR (TVGOS) are now correct (I have Bounce blocked so I didn't check it). But, when I clicked on individual program titles for ThisTV from 9:00am through this evening, each description came up, "No information available", both on the TV and the DVR. I Just sent an email to WJZY 46 GM and He said the The Country network should be coming on just any minute now or Tomorrow and the Engineer is testing it. Mine is showing guide information for all upcoming hours of the night (and tomorrow) as I type this. Of course, TiVo continuously sends this information to every box on a daily basis. Their provider, Tribune Media Services, gets all the (PSIP) info and keeps all info updated 2 weeks out (continuously). I am guessing it is supposed to work this way with your CM-7000PAL DVR; but I am not certain. But if you are still experiencing this issue on THIS TV, please post back. I could check 3.3 on my TV (taking the coax directly from the antenna to the TV while bypassing TiVo) to mirror the issue you outlined. When I tuned to 46.3 just a moment ago, it shows 'test' under the program description. Currently, I see some type of telethon going on with gospel music playing. It doesn't look/sound like The Country Network. Perhaps, there will be answers tomorrow. Currently, I see some type of telethon going on with gospel music playing. It doesn't look/sound like The Country Network. Perhaps, there will be answers tomorrow. That is SBN which is the same channel they transmit on 55.3. I noticed they cranked that up a week or so ago. I wonder if they still have plans for 55.2. SBN is Son Life Broadcast Network and is apparently all Jimmy Swaggart programming. But for Christian programming, I would like to see them carry TBN, which is Trinity Broadcasting with Paul and Jan Crouch. Or Bill Gaither gospel music programs. And for local interest, Jim Bakker has a program originating from his new retreat center in Branson, MO. It is seen on WGGS-16 in the western Carolinas. The owners of this station were friends with Jim and Tammy and carried the old PTL programs. And Tammy Faye last appeared on the You Can Make It show which originated from channel 16 with Joanne Thompson. In spite of the financial issues, PTL was a great ministry and first rate television production. It should have been preserved and restored rather than destroyed by Jerry Falwell. The Insp network that survives today just is not the same. And Heritage USA sits empty. Such a shame. Yes indeed. I remember when Jim & Tammy were transmitting the show from Park Rd. before PTL was built. I might be remembering it wrong, but I think it was from the old Billy Graham home. I think that people like Falwell, Robertson, etc. didn't like the Bakkers because they accepted everyone without judgment and they didn't get involved in politics. Strictly from a television standpoint, PTL was a first rate production that looked as good as Johnny Carson or anything that the Hollywood networks produced. And they had top technical talent, as well as musicians and entertainers. Yes, there were stewardship and financial management issues, but it wasn't the deliberate fraud that it was portrayed to be. The demise of Heritage USA as a top tourist attraction was a huge economic loss for York County and the entire Charlotte region. I just wish they could release some videos of the old Jim and Tammy shows, but last I heard they are locked away in some warehouse down in Georgia somewhere. Here are screen shots taken about 1:00pm today which show an example (a movie starting at 2:00PM) on 3.3 OTA on the TV and DVR. Not sure if I'm being delirious, but didn't Tammy Faye co-host a syndicated talk show with Jm J Bullock, mid 1990s or so? Bullock was the "ditzy" Munroe on the 80s sitcom "Too Close for Comfort" which airs weekends on Antenna TV. It was always a head-scratcher as to how these two got paired up for a talk show. Yes she did ... it was called Jim J and Tammy Faye. She also appeared on Drew Carey, Roseanne, and Surreal Life. And in her last years, she returned to Christian television, with appearances on TBN, Benny Hinn, and locally on WGGS-16 with Joanne.